Just like the occasional bad hair day, we all have bad skin days, too. I recently had one of those days. My skin felt overwhelmingly dry and looked so dull. I didn't get much sleep the night before, and it also felt like the cold air sucked the life out of my skin. Either way, I was in a rush to get home to pamper my pores with hydration. It was near the end of the week, I was exhausted, and it showed. 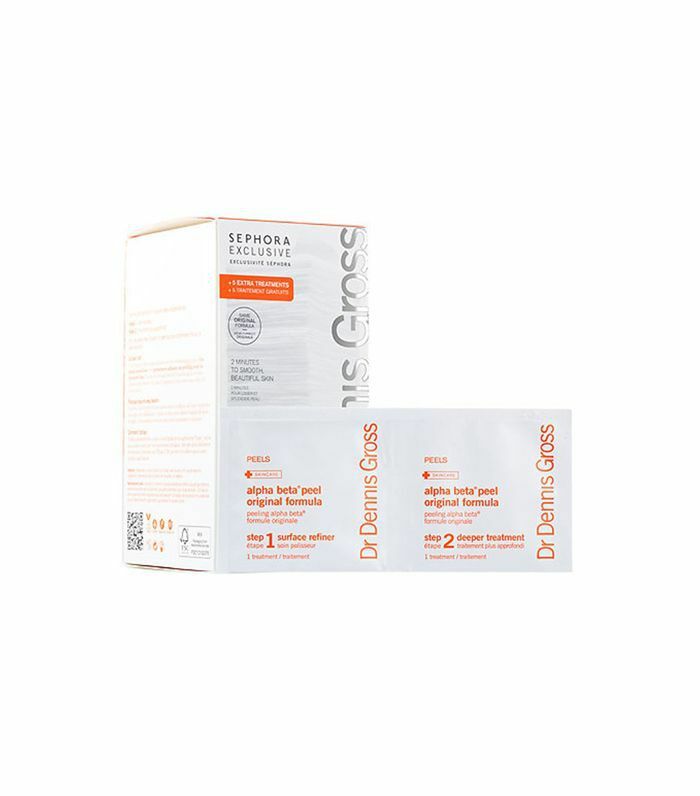 Dr. Dennis Gross Alpha Beta Peels had landed on my desk a few days prior, and I immediately put them in my purse to take home—I've heard such great things. People swear by these peels to get rid of blackheads. I'm a newbie to at-home peels. I'm blessed with abnormally sensitive skin that freaks out over practically everything (so fun, I know), so I've always proceeded with caution when it comes to peels I'm in charge of doing myself. The old me would have left it up to a professional. But after I recently tried Dermaclear Micro Milk Peel and my skin glowed for days, I've been down to give others a try. What I love about Gross's peels is that he formulated a gentle version specifically made for sensitive skin. Of course, I was drawn to these first. It comes with two different pads. 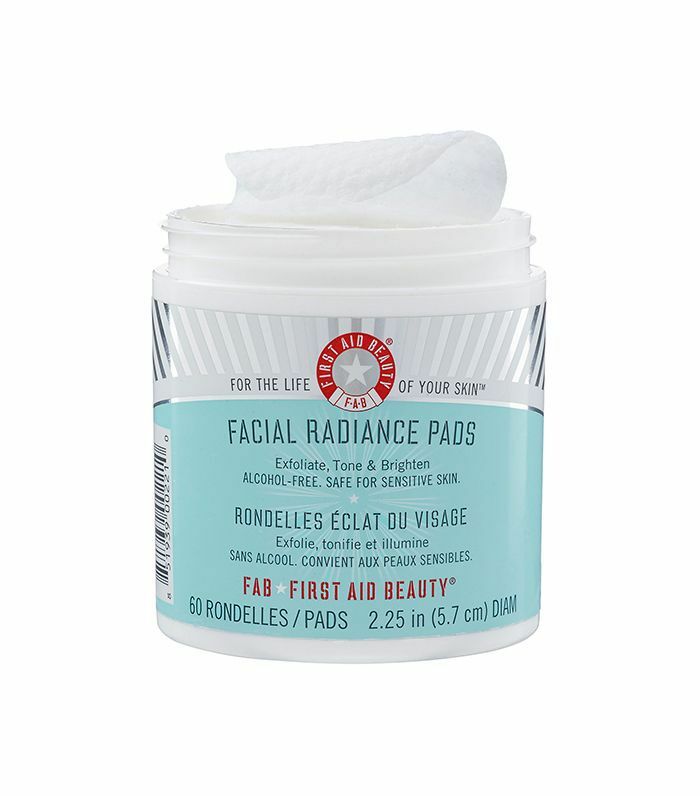 The "Step One" pad is packed with nourishing and hydrating acids that remove dead skin cells and rejuvenate your pores. The "Step Two" pad has alpha hydroxy acid, which delivers anti-aging benefits and smoothes your skin's texture (we'll get more into alpha hydroxy acid and what exactly it is later). After cleansing my skin, I opened up the little package that revealed the step one pre-soaked pad. I lathered it all over my skin and immediately felt a tingly sensation. I'll admit, this scared me. I could tell that it was working, but the immediate tingly sensation made me feel like my skin was preparing for some sort of weird reaction. After about 30 seconds, it calmed down, and I applied the second pad in circular motions. I waited a minute in the mirror and then touched my face. It felt pillow soft and clean. It also looked less washed-out and noticeably plumper. What did this? AHA. I wanted to know more about this key ingredient so I enlisted the help of the dermatologists who'd know best. Here, Dennis Gross, MD, the creator of the wonderful peel I tried; along with Craig Austin, MD, the dermatologist behind Cane + Austin (who makes these trusted glycolic acid pads); as well as dermatologist Patricia Wexler, MD, spell out everything you need to know about AHAs. Read on for the ultimate AHA peels guide that outlines the fascinating ways it can change your skin. What exactly is AHA ? 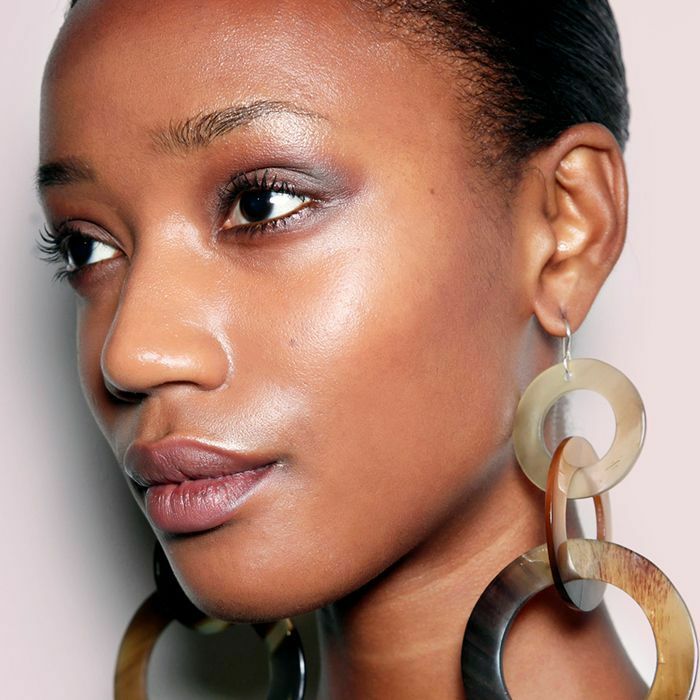 "AHAs, also known as alpha hydroxy acids, are naturally occurring acids that have exfoliating properties that enhance the natural process of exfoliation in the skin," explained Austin. "Some examples include malic acids from apples, lactic acid from milk, and glycolic acid from sugar cane." Wexler also broke down down a few specific benefits. "Various AHAs are applied to the skin for moisturizing and removing dead skin cells, treating acne, improving scars, and treating photo-aging," she explains. Gross doesn't want you to follow you in my footsteps and be scared of them. "I always advise my patients not to be shy with acids. They are amazing for your skin," he said. "Alpha hydroxy acids work with different mechanisms to remove the top layer of skin, otherwise known as the keratin layer, which is the superficial portion of the upper layer called the epidermis. My Alpha Beta Daily Peels contain multiple acids at low concentrations in order to be gentle and effective with no downtime." 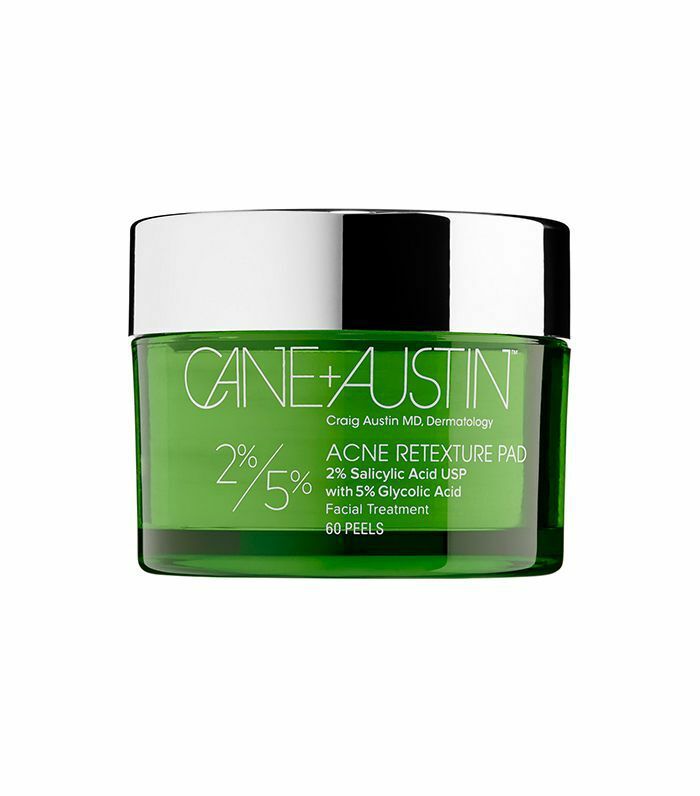 "AHA peels rejuvenate the skin by enhancing exfoliation," said Austin. "This exfoliation allows for dead skin cells to be loosened and removed to prevent buildup that causes skin to appear dull while also evening out skin pigmentation, tone, enhancing collagen production, and helping to reverse the signs of aging. In addition to a more radiant, youthful appearance, AHAs also shrink pores and have the ability to reduce acne." Gross actually recommends peels for the best form of exfoliation over scrubs. "For people who want brighter, smoother, more even skin tone and texture, using peels is a no brainer," he said. "I prefer chemical exfoliation over manual—harsh scrubs can often irritate, whereas chemical peels are using a different mechanism to exfoliate skin more gently. With my Alpha Beta Peel, you see instant results in two minutes, and there are varying strengths for the first timers or the more advanced peel fans. They also offer the benefit of smoother texture, tighter pores, and over time, reduce fine lines." Wexler agrees: "AHAs are great exfoliators and increase blood flow to the skin by decreasing buildup of dead skin cells that dull the skin, thus evening skin tone, softening lines, and minimizing pores," she explains. "Because glycolic acids have the smallest molecular size, they have the greatest bio-availability and penetrate the skin most easily. This accounts for their frequent use in cosmeceuticals. Glycolic acids decrease cellular cohesion at the lowest level of the stratum corneum, exfoliating dead cells, encouraging younger, brighter cells to the surface. This superficial exfoliation ensures reduction in comedonal acne, pore size, and acne lesions." "The beauty of an AHA peel is that while being highly effective, they're also very gentle and there are few limitations," explains Austin. "They're compatible with most commonly used skincare products, including retinols. I always recommend sunscreen to be used on a daily basis, but especially after having an AHA peel. "An AHA peel itself is not a photosynthesizer, but skin may be slightly more sensitive to the sun, so it's important to apply SPF following a peel. If you’re thinking about an AHA peel, you should visit your dermatologist as the treatment timelines vary depending on a wide array of individual aspects such as skin type, condition, and desired peel strength. There are some excellent in-home treatments as well, such as our Cane + Austin products tailored to be used on a daily basis while delivering in-office effectiveness." "My alpha beta peels can be used every day: morning or night," confirms Gross. "They're meant to fit into your daily routine post-cleanse and pre-serum step. We offer different strengths for the peel virgin or pro-peeler. If your skin is sensitive or irritated due to rosacea, eczema, prescription or over the counter retinols, make sure to consult with your dermatologist before treatment. Steer clear of using them immediately after long sun exposure, like a hot day at the beach." Wexler recommends paying attention to the percentage of AHA in each peel. "AHAs peels appear safe in over-the-counter preparations at concentrations of 10% or less. They can definitely cause sensitivity to the sun and should be used with a broad spectrum SPF. Facial peels greater than 10% should be supervised by a dermatologist. Peels have been associated with irritation, redness, and burning. "Even if all of these guidelines are followed, AHA should not be used on inflamed skin, rashes or infected skin. Also, stop using tretinoin or retinol prior to using glycolic peels as this will increase their penetration and possible adverse reactions.There are peels that can be done daily and at home that are formulated with anti-inflammatories and post-procedure barrier repairs. The peels done in-office are usually not done more frequently than monthly. Be sure to avoid the use of lasers or light devices immediately after peels." "My Alpha Beta Daily Peels can be used by everyone and are not dependent on skin type," explains Gross. "I created several strengths, based on frequency and number of acids, which allows our consumers to explore the best treatment for their skin, and includes Universal Formula, Extra Strength, Medi-Spa (a weekly treatment) as well as the Ultra Gentle Daily Peel for those who have sensitive skin or are just trying peels for the first time." Austin recommends trying glycolic acid. "I have been using it on my patients for decades and have found it to be the most effective. As the smallest of the AHA molecules, it is efficacious as well as hydrating. That's why I chose to incorporate it into my products. I've always felt it was a game changer in the skincare industry. Our glycolic pads allow you to gradually increase in strength until you reach results that run parallel to an in-office treatment." "These pads exfoliate, tone and brighten," says Wexler. "They are alcohol-free, which is good for sensitive skin. They contain lactic and glycolic acid with cucumber, gooseberry and licorice, giving global improvement in tone, fine lines, and pigmentation." To be sure you're using the absolute best peel for your skin type, read this guide.